The significance of the North American market to the superyacht world is undeniable. When it comes to just how much this part of the world dominates the global wealth stage, the numbers don’t lie. The Wealth-X Billionaire Census of 2018 outlines that the Americas account for 25 per cent of the global billionaire population. It is for this reason that here at The Superyacht Group, we decided to dedicate an entire issue to this market. For this issue’s ‘Industrialist’ interview, William Mathieson speaks with Barin Cardenas, the founder of The New Yachts Company and the co-creator of the PRIME Megayacht Platforms. “Our philosophy is to make each phase of the ownership process exciting – from the discovery process, through construction and to delivery. It’s what we call Dream, Build, Play,” he explains, discussing how almost two decades of working within the market has led him to focus fully on the ownership experience. This issue also features a comprehensive ‘United States report’, a data-driven review of the US refit, new-build, wealth and brokerage markets. Between 1998 and 2007, US shipyards delivered 270 superyachts, in the following decade they delivered 176, a 35 per cent decrease. However, as Rory Jackson points out in his analysis, the new-build market has “not collapsed entirely, rather been through a period of serious consolidation, with shipyards such as Westport and Delta remaining active throughout.” In order to analyse the current state of the refit market, The Superyacht Report spoke to a selection of the US refit market’s top businesses – including Derecktor Shipyards, Bradford Marine and Lauderdale Marine Center – to offer their opinion on the health of the sector. We hear from Canadian businessman, philanthropist and yacht owner Bobby Genovese about his trials and tribulations in the market, including a planned $1 million refit that concluded with a $7 million bill. “I don’t really remember how it all started because I don’t really even like boats!” he declares, but now is the happy owner of 46.9m Feadship BG (formerly Charade). When it comes to design, is there such thing as a ‘typical’ American style? Georgia Boscawen catches up with Evan K Marshall, the American designer is based in the UK who works with a significant number of US clients and shipyards. Further, Boscawen examines America’s love affair with the distinctive sportfish vessel. Why are these yachts so popular in the US but aren’t typically found in European waters? Felix Sowerbutts spends a few days sailing around US and British Virgin Islands to examine how the area is recovering after the hurricanes of September 2017. Tourism generates 35 per cent of the GDP for the British Virgin Islands, meant repairing facilities after the hurricane (and countering the subsequent reports of its devastation) for tourists a number one priority. Finally, there has been a raft of legislation impacting the US market recently. This issue reports on the various US Environmental Protection Agency regulations, the introduction of the US flag and the 25 per cent custom duties for US superyachts imposed this summer. 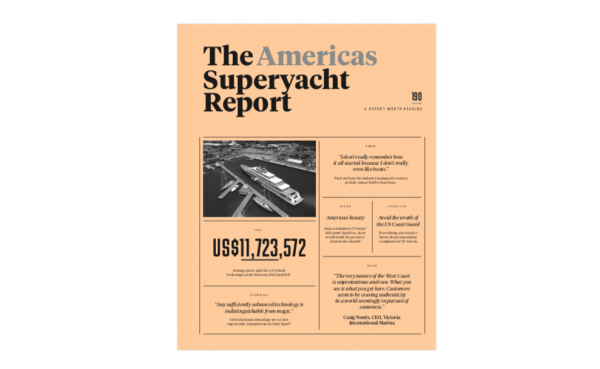 You can read a copy of The Americas Superyacht Report as a subscriber or by buying a single copy. Click to subscribe, or if you’d like to purchase this single issue, click here. It's 'A Report Worth Paying For'. If you enjoy The Superyacht Report and SuperyachtNews, you can't miss The Superyacht Forum. The event, held 12 - 14 November in Amsterdam, features a packed programme of leading industry commentary and market insight. To find out more and secure your place, click here.